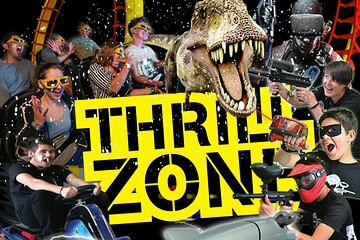 Queenstown’s ThrillZone theme park offers something for the whole family and this multi-activity pass will save you up to 20% off the park’s most popular attractions. Choose from a 2-, 3-, or 4-activity pass and visit the 12D Motion Theatre, try Drift Karting, lose yourself in a 360° Virtual Reality experience, or have fun playing Lasertag or Heroblast at the 360° Battleground. Thrillzone is located on Shotover Street, in the heart of Queenstown. Make your own way to the Thrillzone theme park in central Queenstown and use your pre-paid tickets to gain instant access. Your multi-activity tickets are valid at any time between 10am and 9pm, and there’s no need to book ahead, so simply turn up and head inside! Depending on the tour option selected, your pass will provide entry to up to four different attractions. Perhaps take part in a thrilling 360° Virtual Reality experience on a state-of-the-art simulator; be entertained by 3D movies, multi-sensory effects, and active motion seats in the 12D Motion Theatre; challenge friends or family to a game of Lasertag or Heroblast in the 360° Battleground; or get your adrenaline pumping on a drift kart.